After learning in advance that Han Solo died on Star Wars: The Force Awakens and that Kylo Ren was Hans’ son, I worked hard not to discover anything about Rogue One: A Star Wars Story until I saw it. Thankfully I did and it made the film the better for it. The verdict? I really liked it. I’m trying to work out if it is my favourite Star Wars film yet. Of all the Star Wars movies, it is the darkest, most adult and the most with a feel of an espionage thriller. Multiple story lines bring several characters together, comprising of intelligence officers, criminals, defecting pilots, reprogrammed battle droids, insurgents, weapon scientists and mercenaries. Underlying the plot is the theme of trust, specifically how a lack of trust brings disharmony and failure, and success only occurs when everyone pulls together, when trusts works both ways. The action feels realistic despite this being a space opera, and I think the lack of Jedi’s with superpowers made the battles more personal for me. Scenically this is also the most visually rich of all the Star Wars films, with some great planets include one modelled after Bladerunner’s downtown Los Angeles and another after the alien world in the first Alien film. The world of Jedda resembled an Islamic north African military occupied city with terrorists running amok. The final world with futuristic structures on a tropical island world worked well to create the feel of jungle warfare, which is essentially how the movie comes together in the end with an intense ground battle. All the characters were well crafted. 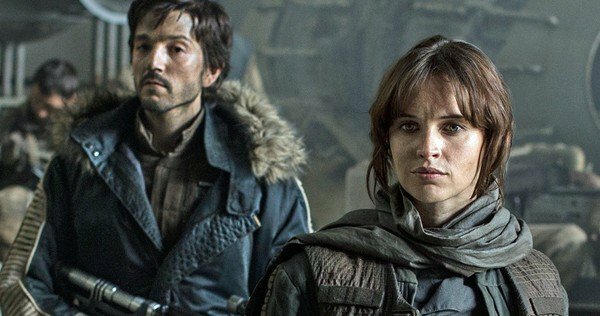 Jyn Erso (Felicity Jones) and Cassian Andor (Diego Luna) have great chemistry which starts out with nil attraction, eventuating only when their true character and honour is brought into the light. Chirrut Îmwe (Donnie Yen) and Baze Malbus (Wen Jiang) are great as the gay couple spiritual warriors and Aussie Ben Mendelsohn delivers another evil and convincing Imperial officer, Orson Krennic. Alan Tudyk is by far the best droid the series has ever had, with the sarcastic and very funny reprogrammed Imperial droid K-2SO. I like how none of the main characters are white Anglo-Saxon males, but I would have liked to see more female characters in the ragamuffin Rogue One crew. Some familiar characters return, a few convincingly created with the latest in CGI technology. There are also hints to what future films may bring, including the origins of Supreme Leader Snoke from Star Wars: The Force Awakens. Rogue One was very enjoyable on all levels, and nicely leads into Star Wars: A New Hope. Not really one for younger children, but for everyone else, highly recommended. A more keen than ever now to see what the Han Solo film produces, now in production. The spin-offs it seems, are a very good idea. Some of the most amazing visuals and special effects that one has come to associate with Star wars. Very entertaining, even for those unfamiliar with the characters and story. Lots of action and new heroes. As a long-time fan, I initially thought there were errors, but now that I know this is supposed to take place days before and/or during Episode 4, everything does make sense and tie together. Not disappointing at all like Episode 7 was. Ugh! Rogue One is appropriate for children, but still provides a lot of tongue-in-cheek and old school references for the mature audience.